Samford University has received a $499,551 U.S. Department of Justice grant that will support a new campus safety initiative at Samford and the four other schools in the Birmingham Area Consortium for Higher Education (BACHE). Samford will take the lead in the "Safety in Numbers" project, a coordinated community response to promote safety for women. The other BACHE member schools are Miles College, the University of Montevallo, Birmingham-Southern College and the University of Alabama at Birmingham. All together, the schools have a total student population of about 30,000. The goal is to promote safety for women through prevention education and to develop effective policies and appropriate responses at the campuses, according to Samford family studies professor Dr. Jonathan C. Davis, who will coordinate the project. "The education supported by the grant will help improve communication concerning gender, power and other key topics that impact our relationships and health," Davis said of the highly competitive three-year grant that begins this month and runs through September of 2015. The release of the grant award was timed by the DOJ to coincide with Domestic Violence Awareness Month. "We can be proud that five of our outstanding institutions in the Birmingham area have come together for a project that will serve as a national model for promoting student safety and particularly the safety of women," said U.S. representative Spencer Bachus, who represents Alabama's 6th congressional district. "This is a unique approach to personal safety that involves not just traditional campus security and law enforcement, but the expertise of human services and counseling agencies in the community. "It recognizes that the best way to deal with violence is to prevent it in the first place, and there is every reason to believe that young lives will be saved by the initiative being announced here at Samford University today," said Bachus. 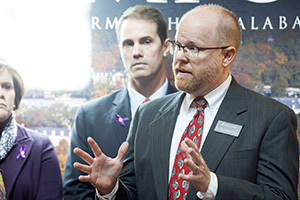 Bachus joined Davis in announcing the grant at a news conference at Samford Friday morning, Oct. 19. Representatives of the BACHE-member schools and community partner organizations that will be involved also attended. The five BACHE campuses will work collaboratively with seven community partners to establish a Campus Coordinated Community Response Team (CCRT) at each school. The CCRTs will coordinate training sessions for new students, campus safety personnel and disciplinary boards on their respective campuses. The community partners are the Crisis Center, Alabama Coalition Against Domestic Violence, Jefferson County Family Violence Coordinated Community Response, YWCA Central Alabama, SafeHouse of Shelby County, City of Montevallo Police Department and the Jefferson County district attorney's office. One emphasis, said Davis, will be to train students in bystander intervention. "When citizens take action, we can prevent untold trauma and improve the health of our community. On campus, this can increase safety and learning for our students," said Davis, adding that the educational component will benefit all students, especially those in health care, ministry, law, pharmacy and other professions that may work with victims of violence. The grant will fund a campus coordinator who will lead education efforts and strengthen campus services for victims. The coordinator will be based at the Crisis Center. Davis, a licensed marriage and family therapist, points out that the initiative will serve a valuable need in prevention, education and community relations. "The project title itself, 'Safety in Numbers,' reflects our cohesiveness as a community and the value of collaboration," he said. "Our community needs this initiative to bring us together, make us healthier, and give us ethical ways to respond to these challenging issues. This is a way our community can come together to support those in need."